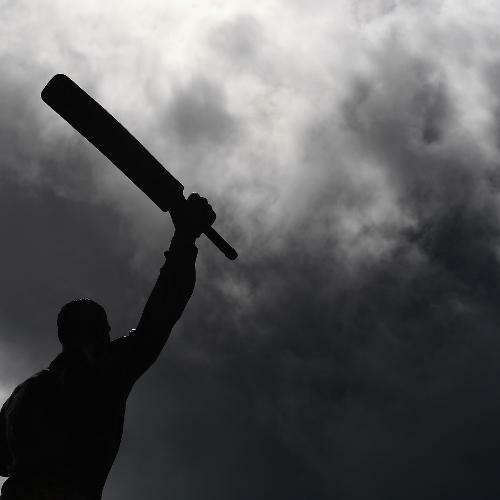 Detailed view of the statue of Sir Vivian Richards outside the stadium during the ICC Women's World T20 2018 Final between Australia and England at Sir Vivian Richards Cricket Ground on November 24, 2018 in Antigua, Antigua and Barbuda. 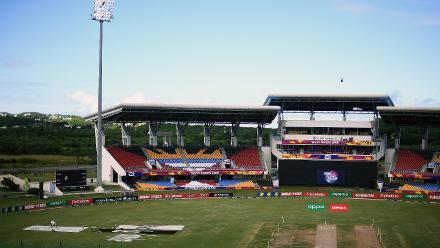 General view of the inside of the stadium during the ICC Women's World T20 2018 Final between Australia and England at Sir Vivian Richards Cricket Ground on November 24, 2018 in Antigua, Antigua and Barbuda. 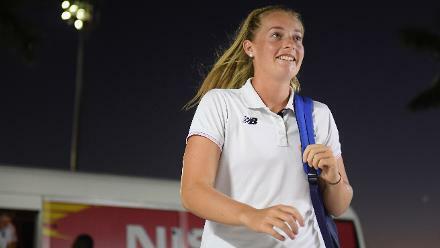 Sophie Ecclestone of England arrives during the ICC Women's World T20 2018 Final between Australia and England at Sir Vivian Richards Cricket Ground on November 24, 2018 in Antigua, Antigua and Barbuda. 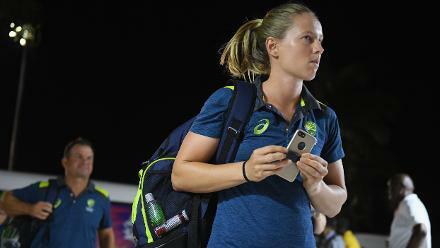 Meg Lanning of Australia arrives during the ICC Women's World T20 2018 Final between Australia and England at Sir Vivian Richards Cricket Ground on November 24, 2018 in Antigua, Antigua and Barbuda. 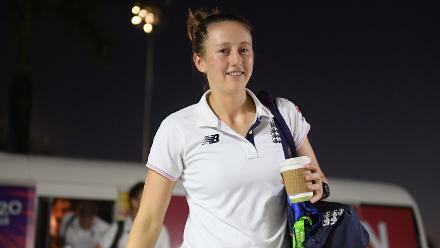 Fran Wilson of England arrives during the ICC Women's World T20 2018 Final between Australia and England at Sir Vivian Richards Cricket Ground on November 24, 2018 in Antigua, Antigua and Barbuda. 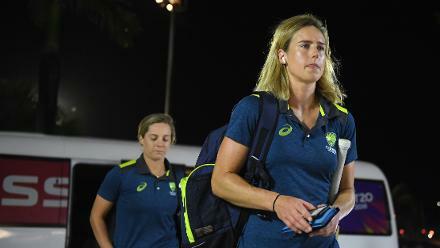 Ellyse Perry of Australia arrives during the ICC Women's World T20 2018 Final between Australia and England at Sir Vivian Richards Cricket Ground on November 24, 2018 in Antigua, Antigua and Barbuda. 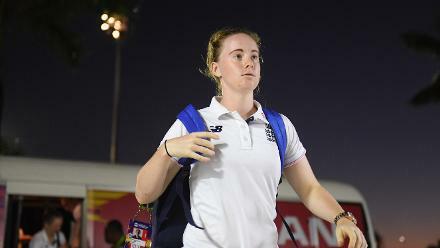 Kirstie Gordon of England arrives during the ICC Women's World T20 2018 Final between Australia and England at Sir Vivian Richards Cricket Ground on November 24, 2018 in Antigua, Antigua and Barbuda. 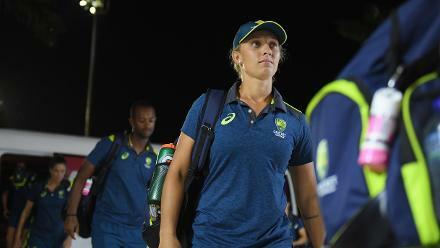 Ashleigh Gardner of Australia arrives during the ICC Women's World T20 2018 Final between Australia and England at Sir Vivian Richards Cricket Ground on November 24, 2018 in Antigua, Antigua and Barbuda. 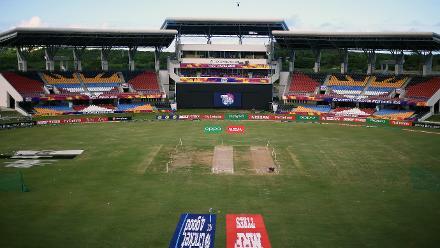 General view of the toss during the ICC Women's World T20 2018 Final between Australia and England at Sir Vivian Richards Cricket Ground on November 24, 2018 in Antigua, Antigua and Barbuda. 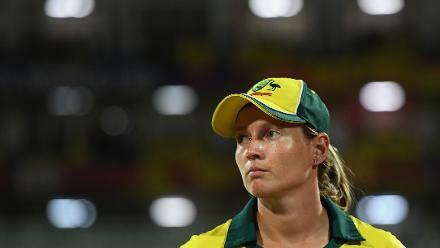 Meg Lanning, Captain of Australia during the ICC Women's World T20 2018 Final between Australia and England at Sir Vivian Richards Cricket Ground on November 24, 2018 in Antigua, Antigua and Barbuda. 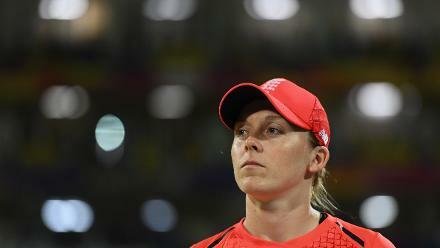 Heather Knight, Captain of England during the ICC Women's World T20 2018 Final between Australia and England at Sir Vivian Richards Cricket Ground on November 24, 2018 in Antigua, Antigua and Barbuda. 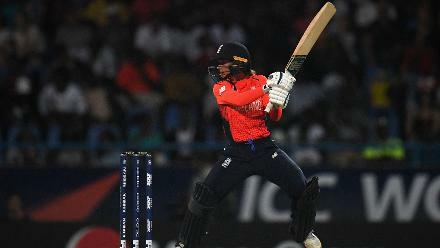 Lauren Winfield of England bats during the ICC Women's World T20 2018 Final between Australia and England at Sir Vivian Richards Cricket Ground on November 24, 2018 in Antigua, Antigua and Barbuda. 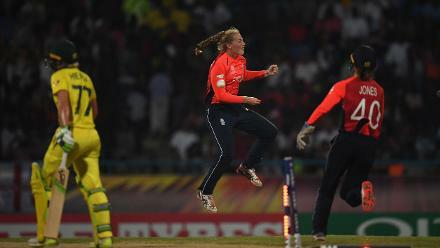 Sophie Ecclestone of England(C) celebrates after dismissing Alyssa Healy of Australia during the ICC Women's World T20 2018 Final between Australia and England at Sir Vivian Richards Cricket Ground on November 24, 2018 in Antigua, Antigua and Barbuda. 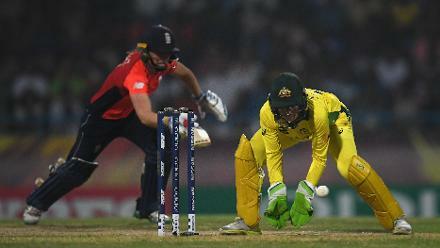 Delissa Kimmince of Australia slips as she attempts to run out Heather Knight of England during the ICC Women's World T20 2018 Final between Australia and England at Sir Vivian Richards Cricket Ground on November 24, 2018 in Antigua, Antigua and Barbuda. 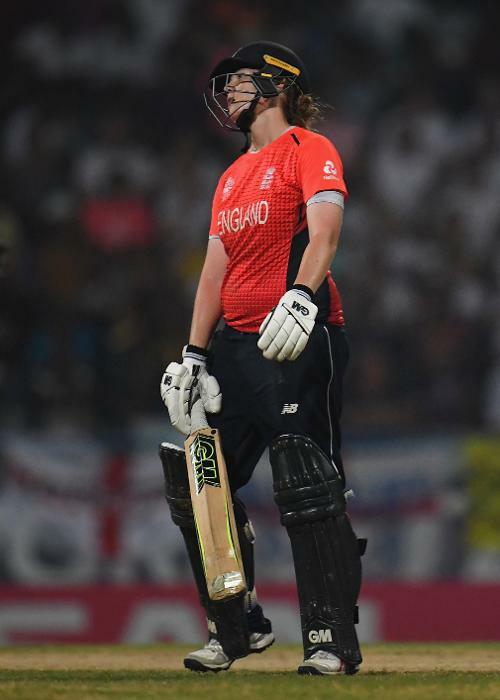 Anya Shrubsole of England reacts after being dismissed during the ICC Women's World T20 2018 Final between Australia and England at Sir Vivian Richards Cricket Ground on November 24, 2018 in Antigua, Antigua and Barbuda. 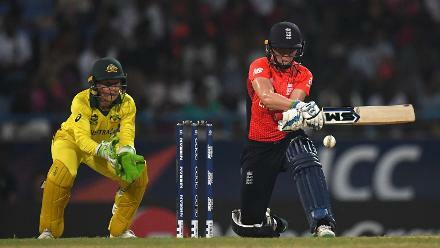 Alyssa Healy of Australia attempts to run out Heather Knight of England during the ICC Women's World T20 2018 Final between Australia and England at Sir Vivian Richards Cricket Ground on November 24, 2018 in Antigua, Antigua and Barbuda. 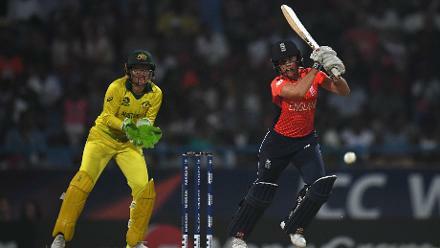 Heather Knight of England bats during the ICC Women's World T20 2018 Final between Australia and England at Sir Vivian Richards Cricket Ground on November 24, 2018 in Antigua, Antigua and Barbuda. 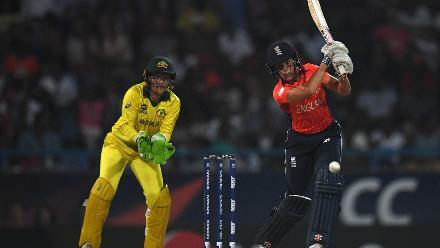 Danielle Wyatt of England bats during the ICC Women's World T20 2018 Final between Australia and England at Sir Vivian Richards Cricket Ground on November 24, 2018 in Antigua, Antigua and Barbuda. 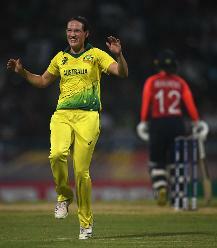 Megan Schutt of Australia celebrates after dismissing Tammy Beaumont of England during the ICC Women's World T20 2018 Final between Australia and England at Sir Vivian Richards Cricket Ground on November 24, 2018 in Antigua, Antigua and Barbuda. 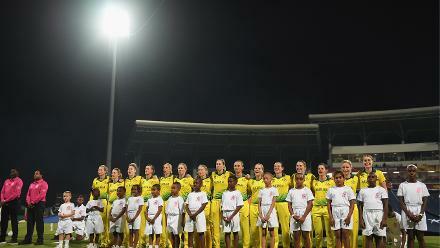 The Australia side line up for the national anthems during the ICC Women's World T20 2018 Final between Australia and England at Sir Vivian Richards Cricket Ground on November 24, 2018 in Antigua, Antigua and Barbuda. 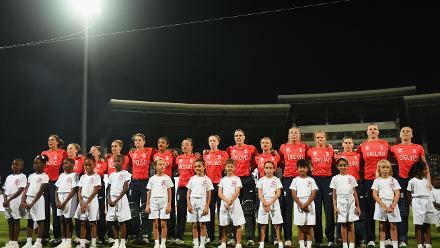 The England side line up for the national anthems during the ICC Women's World T20 2018 Final between Australia and England at Sir Vivian Richards Cricket Ground on November 24, 2018 in Antigua, Antigua and Barbuda. 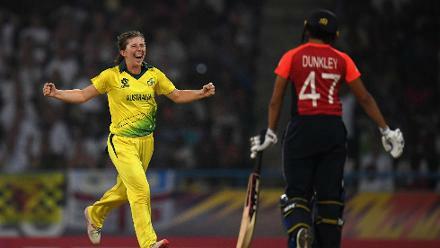 Ellyse Perry of Australia celebrates after dismissing Natalie Sciver of England during the ICC Women's World T20 2018 Final between Australia and England at Sir Vivian Richards Cricket Ground on November 24, 2018 in Antigua, Antigua and Barbuda. 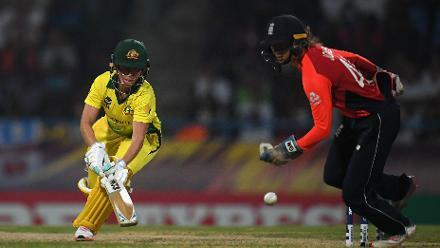 Beth Mooney of Australia attempts to make her ground during the ICC Women's World T20 2018 Final between Australia and England at Sir Vivian Richards Cricket Ground on November 24, 2018 in Antigua, Antigua and Barbuda. 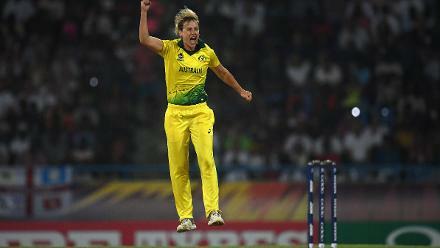 Alyssa Healy of Australia reacts during the ICC Women's World T20 2018 Final between Australia and England at Sir Vivian Richards Cricket Ground on November 24, 2018 in Antigua, Antigua and Barbuda. 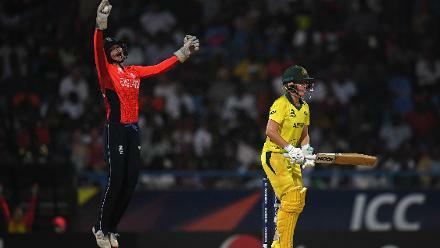 Amy Jones of England(L) celebrates after catching Beth Mooney of Australia during the ICC Women's World T20 2018 Final between Australia and England at Sir Vivian Richards Cricket Ground on November 24, 2018 in Antigua, Antigua and Barbuda. 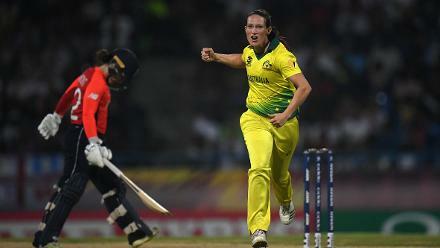 Georgia Wareham of Australia celebrates after dismissing Sophia Dunkley of England during the ICC Women's World T20 2018 Final between Australia and England at Sir Vivian Richards Cricket Ground on November 24, 2018 in Antigua, Antigua and Barbuda. 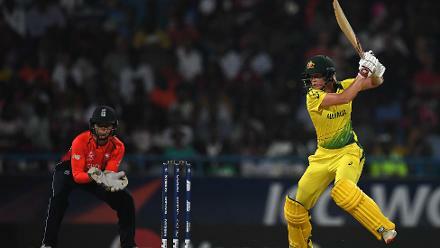 Meg Lanning of Australia bats during the ICC Women's World T20 2018 Final between Australia and England at Sir Vivian Richards Cricket Ground on November 24, 2018 in Antigua, Antigua and Barbuda. 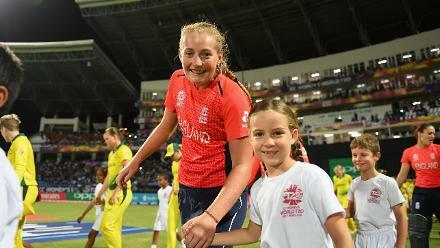 Sophie Ecclestone of England makes her way towards the national anthems with a young mascot during the ICC Women's World T20 2018 Final between Australia and England at Sir Vivian Richards Cricket Ground on November 24, 2018 in Antigua. 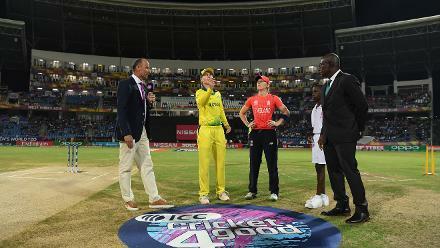 Tammy Beaumont, Sophia Dukley and Sophie Ecclestone of England cut dejected figures after the match during the ICC Women's World T20 2018 Final between Australia and England at Sir Vivian Richards Cricket Ground on November 24, 2018 in Antigua. 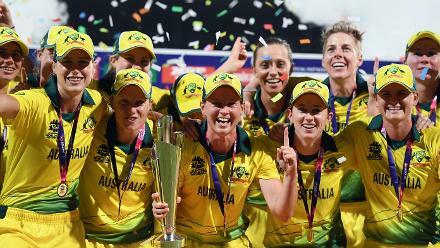 Beth Mooney and Megan Schutt of Australia celebrate during the ICC Women's World T20 2018 Final between Australia and England at Sir Vivian Richards Cricket Ground on November 24, 2018 in Antigua, Antigua and Barbuda. 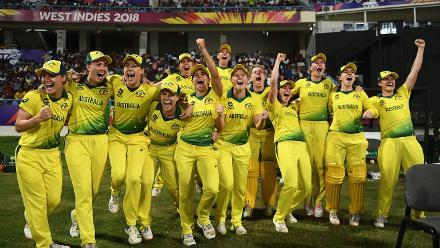 The Australian side sing in celebration after the ICC Women's World T20 2018 Final between Australia and England at Sir Vivian Richards Cricket Ground on November 24, 2018 in Antigua, Antigua and Barbuda. 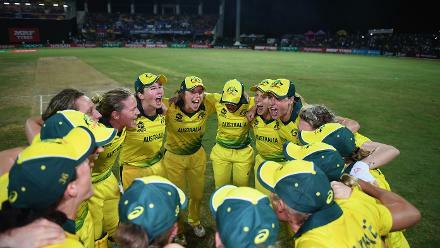 The Australian side celebrate after the final winning runs are hit during the ICC Women's World T20 2018 Final between Australia and England at Sir Vivian Richards Cricket Ground on November 24, 2018 in Antigua, Antigua and Barbuda. 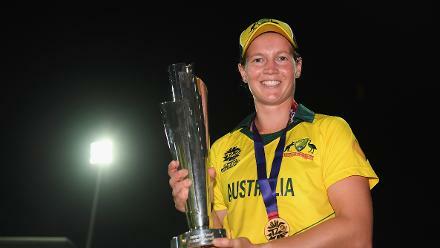 Meg Lanning of Australia celebrates with the trophy during the ICC Women's World T20 2018 Final between Australia and England at Sir Vivian Richards Cricket Ground on November 24, 2018 in Antigua, Antigua and Barbuda. 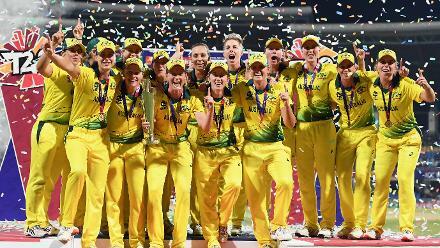 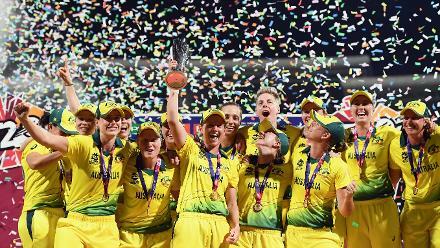 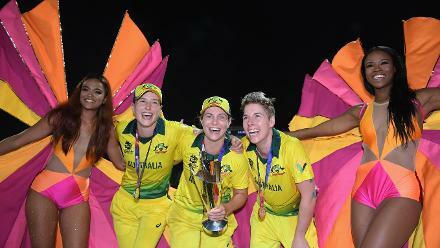 Ellyse Perry, Sophie Molineux and Elyse Villani of Australia celebrate with the trophy alongside dancers during the ICC Women's World T20 2018 Final between Australia and England at Sir Vivian Richards Cricket Ground on November 24, 2018 in Antigua. 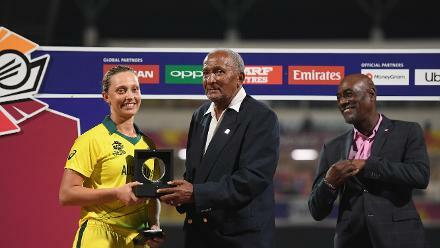 Ashleigh Gardner of Australia is presented with the Player of the Match award by Sir Andy Roberts. 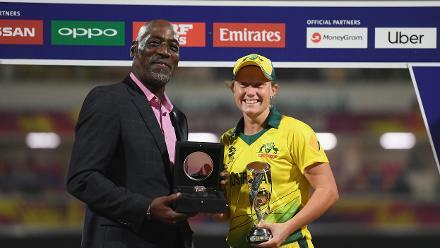 Alyssa Healy of Australia is presented with the Player of the Tournament award by Sir Viv Richards.